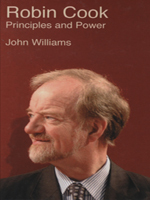 Robin Cook s early death robbed British politics of one of its most distinctive and principled stars. Ten years on, his struggle to reconcile those principles with the realities of power remains as relevant as ever. In this intimate, behind-the-scenes portrait, John Williams, who as press secretary was at Robin's side during three dramatic and turbulent years as Foreign Secretary, shows the reality of a man of strong beliefs facing the compromises and accomodations of New Labour. He reveals the inner workings of modern power-politics, from the European Union to Palestine. And he reflects on what today s politicians and voters can learn from Robin Cook: a man who believed that, despite everything, politics can still be a force for good.